Vigorous and openly upright in habit. Spineless shoots which are hairy when young. Bright green, lobed leaves. Golden yellow clove-scented flowers in spring. Purple-black currents in autumn, contrasting with the good orange-yellow autumn foliage colour. 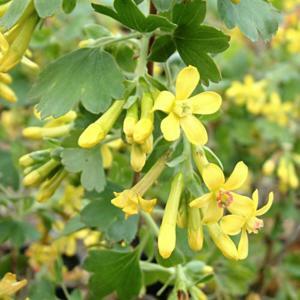 Sometimes sold as Ribes aureum, which is a different species.